Charles H. Townes, Columbia University professor and Nobel Laureate, explains his invention the maser during a news conference in New York City, Jan. 25, 1955. The maser, microwave amplification by stimulated emission of radiation, uses directly the energy radiated by molecules of ammonia gas. 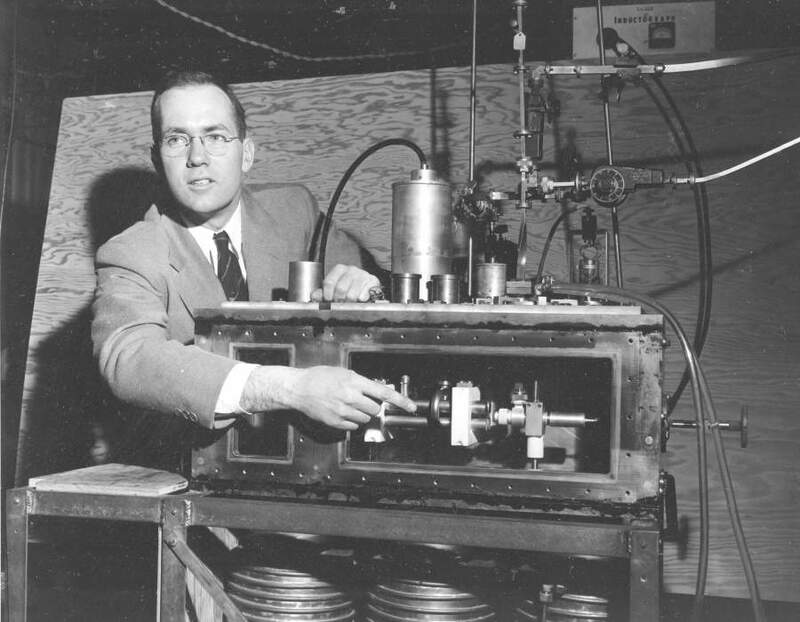 Charles Townes, the physicist who shared the Nobel Prize in 1964 for research that led to the invention of the laser, has died at age 99. He earned a PhD at Caltech and then worked at Bell Labs during World War II, where he designed radar systems. He joined the faculty of Columbia University in 1948 where he did his Nobel Prize-winning work. He also taught at the University of Paris, the University of Tokyo, and the University of Michigan, and in 1961 he moved to MIT where he served as Professor of Physics and Provost. He later moved to UC Berkeley where he taught for decades. The laws of physics are very special, and the creation of human life is really quite striking. One has to believe that either it was planned or it was a fantastically improbable accident. Faith is necessary for the scientist even to get started, and deep faith is necessary for him to carry out his tougher tasks. Why? Because he must have confidence that there is order in the universe and that the human mind — in fact his own mind — has a good chance of understanding this order. Without this confidence, there would be little point in intense effort to try to understand a presumably disorderly or incomprehensible world. Such a world would take us back to the days of superstition, when man thought capricious forces manipulated his universe. In fact, it is just this faith in an orderly universe, understandable to man, which allows the basic change from an age of superstition to an age of science, and has made possible our scientific progress. The necessity of faith in science is reminiscent of the description of religious faith attributed to Constantine: “I believe so that I may know.” But such faith is now so deeply rooted in the scientist that most of us never even stop to think that it is there at all. My own view is that, while science and religion may seem different, they have many similarities, and should interact and enlighten each other. . . . If the universe has a purpose or meaning, this must be reflected in its structure and functioning, and hence in science. In addition, to best understand either science or religion, we must use all of our human resources – logic, evidence (observations or experiment), carefully chosen assumptions, intuition, and faith. . . . Many people don’t realize that science basically involves assumptions and faith. . . . We must make the best assumptions we can envisage, and have faith. And wonderful things in both science and religion come from our efforts based on observations, thoughtful assumptions, faith, and logic. Some new atheists, like Lawrence Krauss in his current dispute with Eric Metaxas, would have the public believe that virtually all physicists reject design. But there have been, and continue to be, prominent and credible physicists like Charles Townes who show that this simply is not true. Indeed, Townes showed that it is possible to be an elite scientist and quite comfortably believe that God has created the universe for a purpose — a purpose not hidden from our gaze, but made manifest in the heavens above.